Down on Long Island, the Woodhull House is scheduled for a $200,000 renovation. This is a big deal to the community because the Woodhull House is the oldest standing house in this area. In fact, it was built by one of the founders of Brookhaven. Every town has its own shared history. There might even be some history in your own home that would be of value to your family and community. When it comes to things like photo albums, keepsakes and mementoes you definitely want to find a way to preserve those items to pass down through the generations. However, when it comes to other items like old kitchen appliances there is no reason to hold onto them. Even if they do have a “history” if something isn’t working it should be replaced. Case in point: your old stove. Surely you’ve have a lot of memories attached to your old stove. All those great meals. All those not so great meals. The holiday dinners. The late night snacks. Yes, if that stove could talk it would have plenty to say! Unfortunately, it might no longer be performing like it once did. Maybe the temperature is off. Maybe food isn’t cooking all the way through. Maybe it takes too long to heat up. Whatever the reason, now might be the best time to buy a new stove. This is the time of year when stores are eager to clear out their showrooms to make way for holiday merchandise. Just like with cars, even though you’re buying a stove made this year it is still considered last year’s model. Nothing wrong with that plus you’ll be getting an exceptional deal. Before you move in your new stove, you’ve got to make way by removing the old one. You should consider making two phone calls. One call to Junk King Capital District and the other to your local gas company. You need to call the gas company because they have to hook up the line on the new stove. You might think it looks easy but actually it’s better to have it done by a certified mechanic. 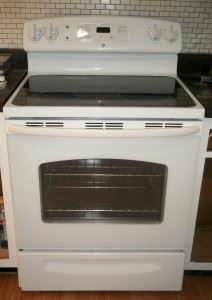 As for that call to Junk King, that will be so you can get the old stove removal fast and efficiently. Junk King are the pros when it comes to removing all kinds of oversized items like kitchen appliances, furniture, construction waste or anything else that won’t fit into your garbage can. Time it right and you can have your old stove taken out by Junk King in the morning and your new stove arrived in the afternoon and the gas company showing up before dinner. Be sure to take full advantage of Junk King Capital District to help you remove all the rest of your junk on that same trip! This entry was posted in Albany Appliance Disposal, Albany Junk Removal, Get Rid of Junk Albany, Junk King Capital District and tagged Albany Appliance Disposal, Albany NY Stove Removal, Old Stove Removal, stove removal on August 28, 2013 by Todd Porter. Last updated August 1, 2017 . Got Junk Items in Albany? Is there anything you have in your front yard that could be considered junk? If so, you might be getting a visit from a representative of the Albany Code Enforcement Department. These are the folks charged with the task of protecting property values. Whether you’re a business or homeowner, the Code Enforcement Department wants to make sure you’re going to get the most from your property if you put it up for sale or refinance. 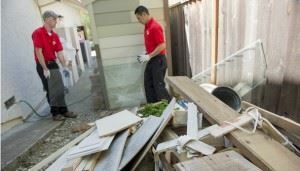 That might mean cleaning up the area surrounding your property as in your neighbor’s home. Translation, if you’ve got junk you better get rid of it or face a fine. There isn’t a lot that the Code Enforcement Department can do about the inside of your home unless they are called in. But they can certainly drive by and see if you’ve got junk piled up by your garage or in your driveway. Things like old car parts, rusted patio furniture, broke porches and anything else abandoned on your lawn is not only an eyesore but brings down the property value of your home and the homes on your block. That’s why you’ll be encouraged to get the junk removed as quickly as possible. In the past, that type of chore proved to be impossible for many without the manpower. Thanks to Junk King Capital District that’s no longer a problem. You’ll get the manpower and the truck space to haul off whatever you need to throw out. One call to Junk King can have a two-man crew dispatched to your home or business for the cleanup effort. When the crew arrives, you only have to tell them what you’re getting rid of and they’ll handle the rest. That means if you’ve got some rotted trunks up in the attic or mattresses down in the basement the Junk King crew will climb the stairs to get that stuff out of your home. They can also load up their truck with all that junk in your yard. It doesn’t matter if the object has been sitting there for years; the Junk King crew will pull it up and get it gone for good! Another big benefit of hiring Junk King Capital District to get rid of your stuff is that they know the proper way to dispose of that rubbish. This means turning it over to a nearby recycling center to be repurposed. If a piece looks like it might have some life left in it then the crew will attempt to drop it off to one of the local charities that refurbish objects to donate to the needy. Those are two proactive ways that Junk King helps keep Albany clean. Clearly, when you’ve got junk then Junk King is the only call to make. This entry was posted in Albany Appliance Disposal, Albany Junk Removal, Get Rid of Junk Albany, Junk King Capital District and tagged Junk Items Albany, Junk King Capital District, junk removal albany on August 23, 2013 by Todd Porter. Last updated August 1, 2017 . Anytime there is a fire across huge acres of land the immediate concern is to get that fire under control before damage is done to homes or businesses. Once the smoldering has diminished a huge sigh of relief goes up from the locals. Unfortunately, the trouble could just be beginning. Case in point: the recent emergency mudslide warning issued to Saratoga Springs residents who live near the burn scars of last year’s wildfires. Because of the damage done to the trees, there are no strong roots that hold onto the soil when it gets wet. The result can be a river of mud that won’t stop. When that happens you’re looking at a huge cleanup. Let’s hope it doesn’t come to that but if it does you should feel comforted that a company like Junk King Capital District is standing by to help. The typical Junk King customer is a homeowner who is merely looking to get rid of all the clutter in their home. Usually this will mean several pieces of furniture, left over construction material, kitchen appliances and other stuff that has been collected over the years. These are easy jobs for the Junk King crew. However, Junk King has often been called on for cleanup after a storm. Sometimes this means dragging fallen tree limbs onto the back of the Junk King truck. It could also mean picking up pieces of a roof that has torn off or the debris from a collapsed shed. If patio furniture was ruined in the storm than that can be picked up by the crew as well. For items damaged by mud or flooding you’ll want to get them removed as quickly as possible. Some things are just beyond being salvaged. Let Junk King Capital District haul them away. Don’t worry about the mess. A Junk King crew isn’t happy unless they end their day covered in dust and grime. That is proof they got the job done. As mentioned above, you don’t have to wait for a storm to hire Junk King. They are just as happy to work on a sunny day as they are on a rainy day! If you missed out on getting your spring-cleaning done this year, it’s never too late to get rid of all the clutter around your home. All you have to do is call Junk King to put the plan in motion. As for pricing, Junk King is extremely fair. You’re not going to be hit with labor costs, travel time or dumping fees. You’ll be given an estimate based on the amount of space your junk will take up on the truck. One price. No fuss. Give Junk King a try today. You won’t be disappointed! This entry was posted in Albany Junk Removal, Saratoga Springs Junk Removal and tagged Saratoga Springs Hauling, Saratoga Springs Junk Removal on August 1, 2013 by Todd Porter. Last updated August 1, 2017 .